Breaking down last weekend's "snowstorm"
Not quite how the storm turned out for us. Photo credit to The Weather Channel. Unless you live under a rock, you probably heard that we were going to get a massive snowstorm this past weekend. But we didn’t. Sure, we got rain and freezing cold temperatures, but what happened to the foot of snow that was supposed to be dumped on Rye? Meteorology is no easy task because weather is so complicated. It’s nearly impossible to predict such an unpredictable phenomena. Weather is constantly changing, so meteorologists do the best they can with what they’ve got. However, in this case, they messed up big time. Leading up to the storm, the weather forecasters on the local news were promising a lot of snow. First it was 2 to 4 inches. Then 9 to 11. Then 15 to 17. Then 3 to 5. Then just rain. This screenshot from The Weather Channel proves how terribly wrong the forecast was. It shows Rye receiving 8 to 12 inches of snow between Friday and Saturday. That was wrong. As someone who doesn’t like snow (especially a foot of snow! ), I wasn’t particularly upset that we didn’t get any. But still, messing up the forecast so badly is dangerous. Airports began canceling flights more than 24 hours before the “huge storm.” I can imagine it’s annoying having your flight canceled a day in advance only to not get any snow. Furthermore, the Rye DPW dumped tons of salt on the roads in preparation for snow. As someone who loves the environment, this bothered me because the rain we got instead of snow washed all of the salt into the storm drains, which leads to the Long Island Sound. And as someone who loves dogs, this bothered me because the salt they put down isn’t pet-sensitive. For my dog at least, the salt severely irritates her paws. 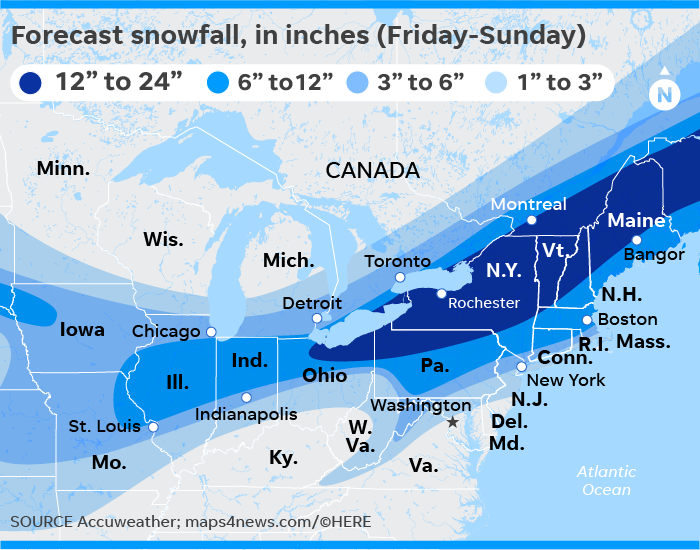 This forecast prediction map from Accuweather shows the Tristate Area receiving 3 to 6 inches. Also wrong. As I said before, it’s not easy being a meteorologist. However, this isn’t the first time that the weather was so poorly-predicted. On March 7th of last year, we had a similar situation. Because there was so much snow expected, school was canceled the afternoon before. Of course, all we ended up getting was a dusting of snow and a shorter Memorial Day break. Sensationalizing the weather is not good. Regardless of whether meteorologists are over-exaggerating the forecast for more views or simply because they got it all wrong, they need to do a better job.